Password needs to be protected as it is very sensitive information. Many times, it is difficult to manage when we have so many passwords. For this purpose, there is a requirement of such platform which can act as a password manager. I full fill this need from the app named as PassVult available at the Apple store for iOS. It’s really ultimate app which gives ownership to the user of their password data by localizing the entire data on an individual iDevice. I too get my ownership of my password with this app and like this it’s easy to manage my passwords. This is one of the easiest ways of getting the password management system. What more I get in this app? Store & manage credit card: I store all my credit card information in this app. Like this, I have a single secured place to store my confidential information’s. You can store information’s like card number, card owner name, expiry date & CVV number. One master password: You can get one master password for your all passwords. Secret questions: You can add some secret questions and answer within this app. You can add your service name; a secrete question, answer, URL & notes in that. Physical codes: You can also manage all your codes related to your service. Random generator: The password can also be generated randomly using the random generator feature. I get one strong password for this feature. Check for breaches: You can also check for the breaches to check if your email was disclosed in any of public breaches. AES encrypted: The data is stored in the local database which is Advance Encryption System. Besides these there are also some other features like your password will not be shared with any other third party. PassVult is truly made for those who value privacy for their data. It is secured and the information is never transferred to any other cloud. If you find any kind of bug then you can also report for the same and the supporting team will reach to you. 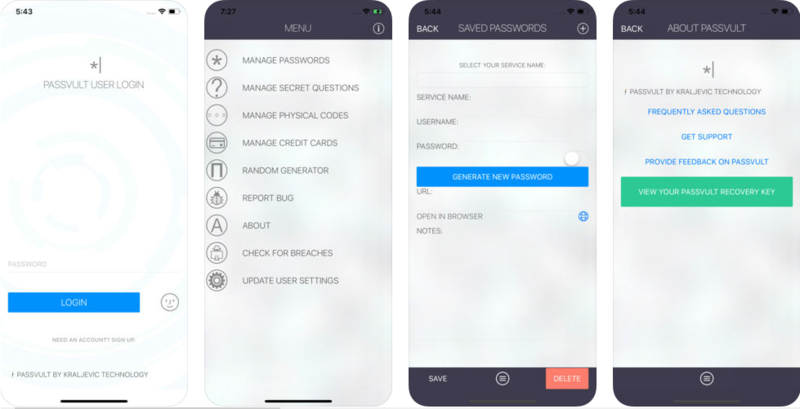 PassVult app is really a perfect app for managing my password. Now I don’t need to worry about my password as my all data are secured within my iPhone. I am happy with the services and features of this app.